When talking about handbags, we have to talk about Louis Vuitton bags because there are so many gorgeous designs available. There are four main groups of handbags, each of them is for a different occasion and with something unique as far as style goes. As far as colors and pattern go, there are some that are very popular and can be found throughout the whole range of models. Top handle handbags usually come in big sizes and can be used for carrying quite a lot of things. The short top handle makes them very comfortable and easy to use but the main attraction is the style. Because of the large size, there is always something gorgeous about top handle Louis Vuitton bags and you can find some made from leather or fabric with the monogram pattern. Shoulder evening bags can be very practical and used for everyday purposes. They are big enough for holding quite a few items and fashionable enough for every outfits.Â Here is where the true Louis Vuitton style can easily be found and from a current line of 20 models, you can easily take your pick. Prices can vary from $800 to over three thousand dollars depending on the model but every one of them looks amazing. Evening bags are quite small but they offer just enough room for the essentials while creating a gorgeous look. These Louis Vuitton bags are for special occasions and they can really complete an outfit perfectly. There are some with removable shoulder handles but the classic look is simple without any handles and the client can just hold it in her hand. Although there are only 12 models in the current collection, there are some of the most amazing design with bold lines and unique styles. The LV logo can be found on all of them and there is also a rainbow of colors available. Clutches are somewhere between the shoulder bags and the evening bags as far as size goes. They are very fashionable but with more room. A top shoulder handle is very common with these handbags and Louis Vuitton even offers some with colorful drawings on the side; this is for a plus of style and they look great. 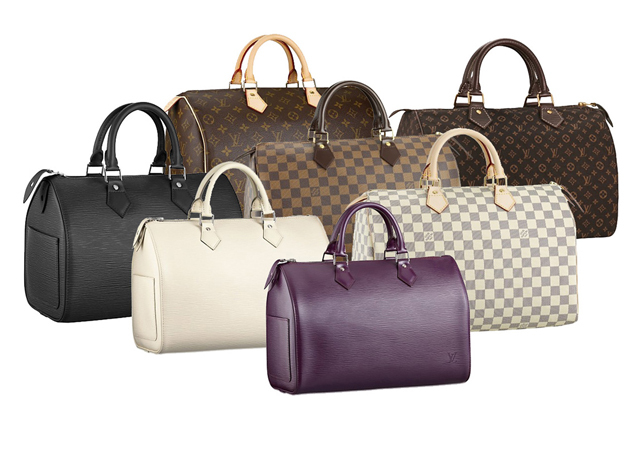 These are the four main groups of Louis Vuitton bags with different sizes for different occasions. Having at least one from every group is enough to offer a fashionable look wherever you go.